Redwood Forest in Northern California. Hyperion not pictured. Credit: Jeff Hollett. The world’s tallest tree is a redwood called Hyperion which towers above the ground in Redwood National Park, California. The goliath with leaves was identified in 2006 and measures exactly 115.85 meters (379.7 feet) in height with a width of about 22 feet (7 m) at its base. For comparison, New York City’s landmark Statue of Liberty is 93 meters (305 feet) tall while London’s Big Ben reaches a height of 96 meters (316 feet). Imagine a 35-story skyscraper in your city — that’s about how tall a giant redwood (Sequoia sempervirens) can grow. Closely behind Hyperion are other Californian redwoods like Helios (114.1 meters/374.3 feet) and Daedalus (110.8 meters/363.4 feet). Shortly after Hyperion was discovered, Jim Spickler, a canopy scientist, climbed the giant tree and described his experience in a video documentary embedded below. According to the researcher, the most reliable way to measure a tree’s height has remained unchanged for centuries: just use a tape ruler — a really big one in this case. “Just climbing up, the sense of exposure you get is just incredible. At 200 feet you’re still at the zone where it’s just the trunk. And then as you get a little bit higher, you start entering the lower crown of the tree. And that point the crown envelops you and you have that sense of ‘Wow! Am inside this organism, inside its arms, its branches, and you lose for a moment .. just a moment the sense of the ground. You’re in this new world, this canopy world, and you continue up the experience changes again — because being that it is the tallest tree, you’re climbing to a point where you’re above the rest of the forest. And at that point, you’re on the tip of the spire,” Spickler said. “The view from the top of the world’s tallest tree is second to none. There’s nothing like it on the ground. You cannot imagine the experience,” he added. The tallest out of three trillion trees currently alive in the world is still growing. Hyperion is currently growing at a rate of 3.9 cm per year (1.5in/y) since it was discovered in 2006. However, at this rate, another redwood called Paradox, which grows by 18.9 cm per year (7.4 in/y), could overtake it by 2031. But what’s the limit to which a tree can grow? Plants produce sugar in their leaves, which then gets diffused through the leaf’s network of tube-shaped cells called the phloem. When sugar circulates, it gathers momentum, so the more room it has to move the higher its velocity and therefore the faster it will reach the rest of the plant. Phloem can be found in stems, branches and tree trunks as well, only here they act as bottlenecks. So, there comes a point where if the leaves were to get any bigger it would be a waste of energy. It’s because of this limit that trees reach a height limit. Typically, tall trees reach their limit when the leaves are still small, since the sugar needs to pass through most of the trunk to feed the roots. Scientists used mathematical equations, finding that there’s an equilibrium point where unusually large or small leaves both cease to be viable. The range of leaf sizes narrows and at around 100 m tall, the upper limit matches the lower limit. If a tree passes this limit, then, according to the researchers’ predictions at least, the leaf ceases to become viable anymore. This ceiling is around Hyperion’s 115-meter mark, so one can expect its rate of growth to become negligible after a couple of decades. There are many reasons why redwoods in particular can grow so majestically tall. Redwoods are virtually untouched by diseases or damage by insects thanks to the high tannin content of the wood. Thick bark and foliage that rests high above the ground provides protection from all but the hottest fires. The soil into which the redwoods extend their roots is complex, supporting not only the redwood’s growth but also that of a verdant array of greenery, fungi, and other trees. Finally, California’s climate, with mild year-round temperatures and heavy annual rainfall, rounds up the string of favorable conditions that allow redwoods to reach for the sky. Scientists estimate that Hyperion is around 600 years old, but seeing how some have been documented at more than 2,000 years old, Hyperion will likely remain a marvel to behold for centuries to come. And if you can believe it, Hyperion just narrowly escaped being cut down. In the 1970s, 90% of the country’s ancient forest owned by the federal government was cut. Just a hundred meters away from Hyperion used to lie a barren landscape formed by tree logging. According to anecdotal reports, this area used to house redwoods that were even bigger and taller than Hyperion. Luckily, the Carter Administration seized the valley where Hyperion grows and added it to Redwood National Park. 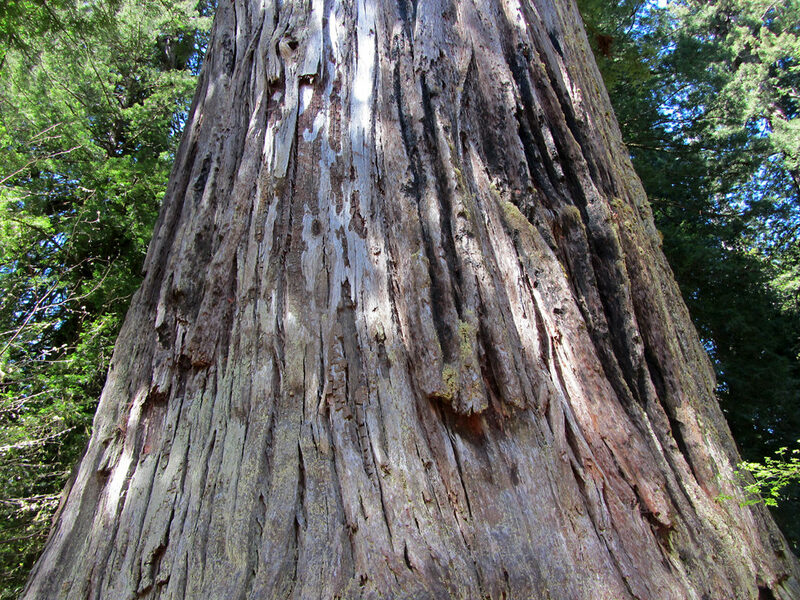 Only 4% of the park’s historical redwoods have escaped logging. Other worthy mentions of hyper tall trees include the 99.8-meter-tall Centurion, in Arve Valley, Tasmania, Australia, which is the world’s tallest known individual Eucalyptus tree and the 99.7-meter-tall Doerner Fir, a coastal Douglas fir growing in a remnant old-growth stand on the east side of Coos County in Oregon.